Ghosts Of Katrina Still Haunt New Orleans' Shattered Lower Ninth Ward A decade after the hurricane, the city has mostly bounced back, but not the African-American neighborhood with some of the worst damage. Many people didn't return; life's a struggle for those who did. The flooded streets and destroyed homes of the New Orleans neighborhood known as the Lower Ninth Ward were among the most powerful and iconic images from Hurricane Katrina and its aftermath 10 years ago. Now, much of New Orleans is back — more than half of the city's neighborhoods have recovered some 90 percent of their pre-storm population. That's not the case for the Lower Ninth. Today, there's a feeling of desolation on nearly every block of the predominantly African-American neighborhood. One of the first things you notice is the many empty lots, several on every street. Instead of houses, they now hold weeds and tall grass. After Katrina, only about 37 percent of households returned to this once-vibrant neighborhood, which had a population of about 14,000 in 2000. Edward Gasper is among those who came back. He grew up in the neighborhood and was out with his son recently cutting grass in some of the empty lots. "We're trying to get these lots back together down here," he says. "It's horrible, it's real bad." The Lower Ninth Ward is cut off from the rest of New Orleans by a shipping channel, the Industrial Canal. During Hurricane Katrina, when the canal's flood walls gave way, water surged through the neighborhood, pushing houses off their foundations. Water, up to 12 feet deep, stood in some areas for weeks. It was the last neighborhood to have power and water service restored, and the last to be pumped dry. The devastation was worst on streets near the flood wall breach. Bobbie Banks lived on one of them with her husband and daughter. "My house ... was really pulled to the front of my yard," she says, describing what she saw when she returned after Katrina. "It was, like, four other houses in my yard." There used to be more than a dozen homes and businesses on this block. These days, there are just two houses, hers and one other. 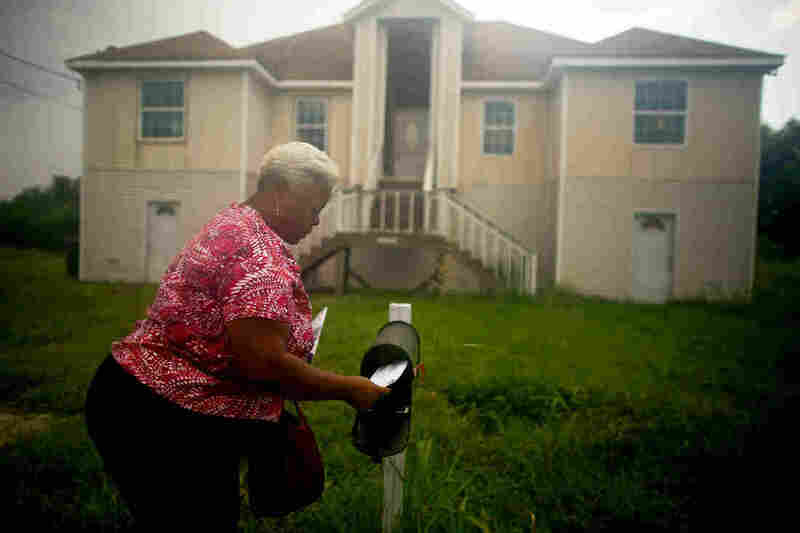 Bobbie Banks collects mail at her home, which she struggled to rebuild and still cannot occupy. Her first contractor took $105,000 of her money, but didn't finish the work. Then she had to rip out toxic drywall that another contractor used. Standing in front of her reconstructed, two-story home, she recalls what her block was like before the storm. "There were very nice houses in this neighborhood," she says. "This was a barbershop and a beauty salon on the corner here. Mona and her uncle was the barber right there on that corner right there." Before Katrina, there was a bar on the street and a church on the corner. Banks knew all of her neighbors. She says they looked out for each other. "This little space right here? I had an old neighbor. His name, they called him Superman," she says. "And ... people would come for me, he'll tell them, he'll say, 'Oh, they not there.' He would let them know." After the flood, about 700 people took a buyout in the Lower Ninth Ward — choosing not to rebuild, and instead turning their property over to the state. Some who want to rebuild haven't been able to afford it. And those who did rebuild faced obstacles. A major problem was that because home values were low here, the federal money allocated for rebuilding sometimes didn't cover the full cost of reconstruction. Bobbie Banks knows all about the obstacles. She's recently widowed and on disability. Although her house is back, she's not in it. She's staying in a rental property nearby. Her story is a familiar one in post-Katrina New Orleans. A contractor took her money and didn't finish the work. "One-hundred-and-five thousand dollars is what he took from me. I was just so anxious to get back home. Trusting him was a big mistake for me," Banks says. She hired other contractors, and volunteers helped complete the rebuilding. Then, Banks found her home had been built using toxic drywall imported from China. It all had to be ripped out. Plus, the house has termites. But, with the help of some nonprofit groups, she hopes to be back soon. "It's been so much trouble, but that's where I lived," she says. "That's home." It's home, but it's not like it used to be. There are fewer people on the streets. Many say they no longer know their neighbors. Some streets are so filled with potholes, cars can't drive down them. There are a few convenience stores and fast food stands, but no supermarkets or grocery stores. At least once a week, though, there is one place in the Lower Ninth Ward to find fresh produce. Every Tuesday, a mobile farmers market run by a local nonprofit visits a senior citizens center in the Lower Ninth and quickly sells out. Inside the senior center, there's something else that's sometimes hard to come by in this sparsely populated neighborhood: a sense of community. Annie Wright is from the Lower Ninth but lives in a different neighborhood now, Gentilly Terrace. Although there's a senior center in Gentilly, she drives to this one in the Lower Ninth Ward to see her friends, many of whom now also live outside of the neighborhood. 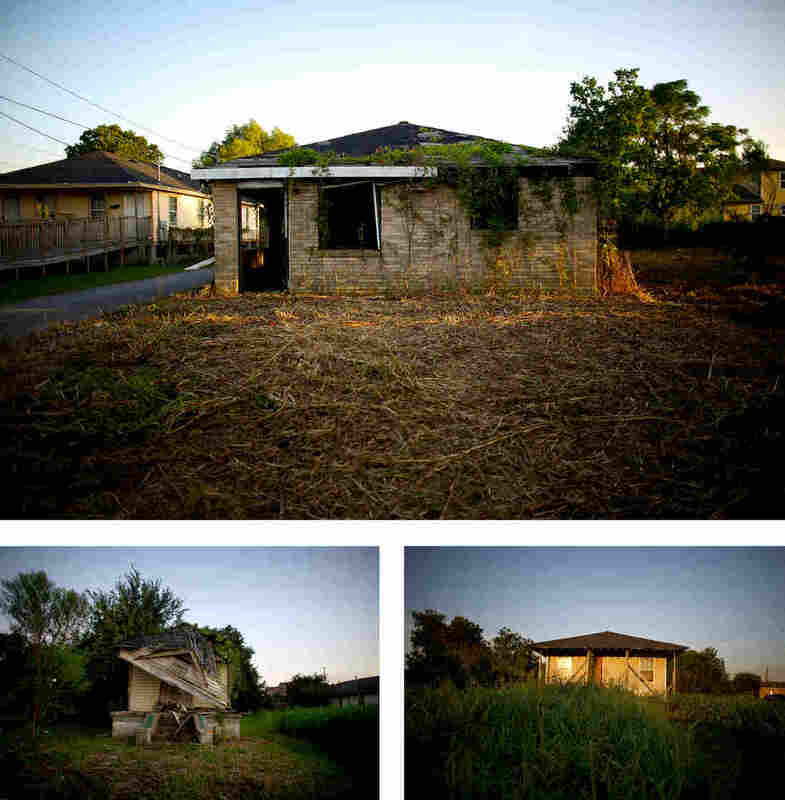 Wright planned to rebuild her home and return to the Lower Ninth Ward after the storm. There was a kind of agreement, she says, among all the neighbors on her street. But time and circumstances intervened. "The neighbor who was next door to me, just so happened she died before we came back," Wright says. "And after she died, I decided, 'Oh, I don't want to be back without her.' "
On her old street, Wright says just three of her neighbors returned. Sitting next to her at the senior center, Sidney Davis says he did rebuild and return, but isn't happy about it. Does he think he made the right decision? 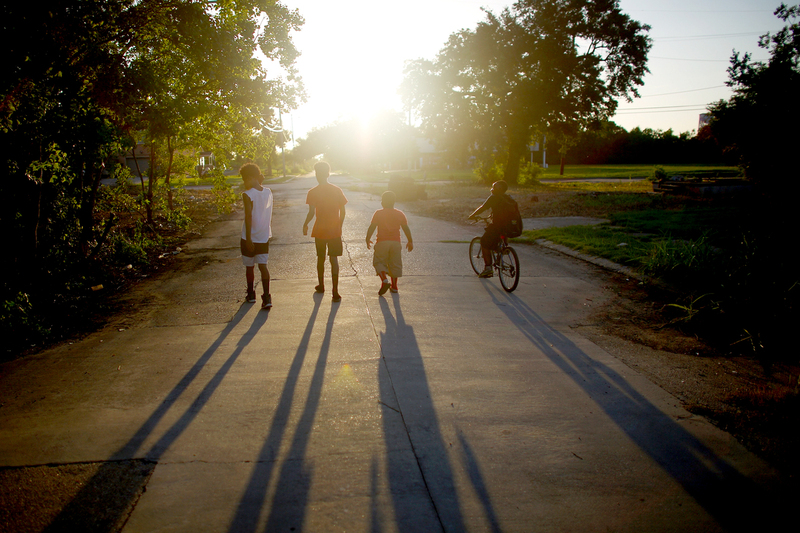 Children walk down one of the many empty streets next to the vacant lots where houses once stood. "No," he says. "Because nothing seems the same. Everything is what you call depressing. There's no stores. There's nothing else you have down there." With so many empty lots in the Lower Ninth, property values remain low. In some cases, newly built homes are worth less than the cost of construction. But a decade after the floods, there are some signs of progress. In the past year, 150 people moved back. A high school is opening soon in the neighborhood. A drugstore is on the way, and the city recently invested $19 million in a new community center, with a health clinic and indoor pool. Bobbie Banks just signed up for a water aerobics class.